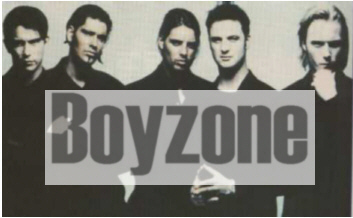 Boyzone are an amazing Irish quintet who have had huge success everywhere they go - Europe, Asia... but unfortunately Boyzone has yet to become a household name in North America!!! Stephen, Shane, Keith, Mikey and Ronan make up this great band. They've put out amazing songs such as "Key to My Life", "Picture Of You" (which was on the Mr. Bean movie soundtrack!!! ), and my current favourites "No Matter What", "I Love the Way You Love Me" and "All that I Need". They were also featured on U2's hit "The Sweetest Thing"!!! Their latest CD "Where We Belong" is always in my CD player!!! And it's what I most listen to currently. I had always liked Boyzone, since about 1994 I think. Their songs were fun and catchy.... and I loved Ronan's voice!!!! I could not get over how awesome his voice was!!! But I think I became a major fan just this past summer with the release of "Where We Belong"... I love this CD and I think it is the best they have ever done. "No Matter What" is just the best song ever... and "All That I Need" is wonderful.... after I heard "All That I Need", I HAD to get someone to send me the CD.... and since then I can't stop listening to it!!! Listen to some of Boyzone's songs... and I think you will agree with me when I say they are just brilliant!!!! And incidently the ones that they have released are also the ones I like best on the album!!!! In August 2001, I had the opportunity to meet Ronan Keating and see him in concert in Toronto. It was excellent to finally be able to meet him in person and he was really nice as well. The concert itself was brilliant. He performed for 45 minutes and sang all of his hits. A dream come true.